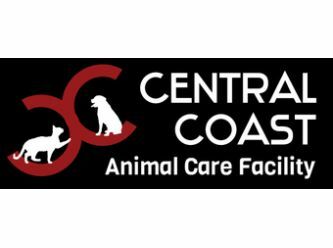 Central Coast Animal Care Facility (Gosford Pound) is a non profit organisation with a small but dedicated group of staff and volunteers. We began operation on 1st July, 2016 as the successful tenders for Gosford City Council Pound. Although a new business, the staff and volunteers of CCACF have years of experience in rescue and our aim is to find loving homes for all of the dogs and cats in our care. Introducing Kelsie! Kelsie is a Staghoundy x. Born on 1st December, 2018, Kelsie is looking forward to finding her forever home. Kelsie is currently housed with her 5 brothers and sisters and they love to play and get along very well. She loves her human companions and meeting new friends. Being a pup, she will be easily trainable and these loyal dogs love to please their owners. To help kickstart this training, we have included free puppy pre school in her adoption fee, with thanks to Wyong Dog Training Club. Like every pup, Kelsie will thrive with early socialisation and exposure to many different people, sights, sounds, and experiences will ensure she grows to be a well rounded gal. She still has so much to learn about the world and life and would love to be in a home where she is included as a member of the family. Kelsie will thrive in an environment that guides her with positive direction and lots of love and attention. 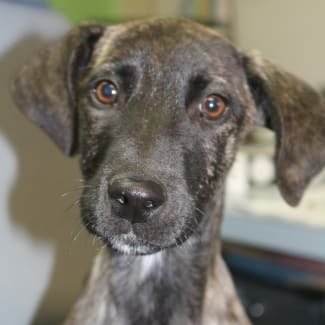 Being young she is still growing into her personality, but this little girl is a very loving pup who cant wait to find her forever home. Please note that if you have an existing dog in residence, we will require a meet and greet to ensure they get along and will be always best buddies. When organising a meet and greet, we will require a current vaccination certificate for your existing dog to ensure that there is no chance of infecting the pups who are currently not up to date with their vaccinations. Kelsie's adoption fee is $600 and includes her desexing, vaccinations and lifetime registration. Kelsie is also regularly treated for flea and worms. To enquire more or to meet Kelsie, please call 02 43044350 or email gosfordpound@gmail.com and speak to one of our friendly staff. Kelsie is looking forward to meeting you. Introducing Chase! Chase is a Koolie x Bull Arab. Born on 16th February, 2018, Chase is looking forward to finding his forever home. Chase is currently housed with his 8 brothers and sisters and they love to play and get along very well. He loves his human companions and meeting new friends. Being a pup, he will be easily trainable and these loyal dogs love to please their owners. To help kickstart this training, we have included free puppy pre school in his adoption fee, with thanks to Wyong Dog Training Club. Like every pup, Chase will thrive with early socialisation and exposure to many different people, sights, sounds, and experiences will ensure he grows to be a well rounded boy. He still has so much to learn about the world and life and would love to be in a home where he is included as a member of the family. Chase will thrive in an environment that guides him with positive direction and lots of love and attention. 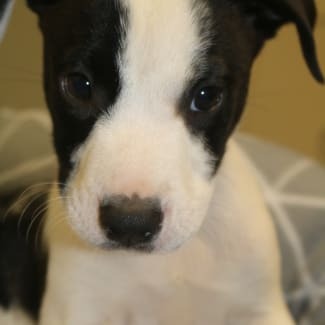 Being young he is still growing into his personality, but this little boy is a very loving pup who cant wait to find his forever home. Please note that if you have an existing dog in residence, we will require a meet and greet to ensure they get along and will be always best buddies. When organising a meet and greet, we will require a current vaccination certificate for your existing dog to ensure that there is no chance of infecting the pups who are currently not up to date with their vaccinations. 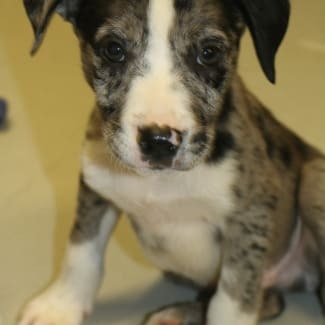 Chase's adoption fee is $600 and includes his desexing, vaccinations and lifetime registration. Chase is also regularly treated for flea and worms. To enquire more or to meet Chase, please call 02 43044350 or email gosfordpound@gmail.com and speak to one of our friendly staff. Chase is looking forward to meeting you. Introducing Panda! Panda is a Koolie x Bull Arab. Born on 16th February, 2018, Panda is looking forward to finding his forever home. Panda is currently housed with his 8 brothers and sisters and they love to play and get along very well. He loves his human companions and meeting new friends. Being a pup, he will be easily trainable and these loyal dogs love to please their owners. To help kickstart this training, we have included free puppy pre school in his adoption fee, with thanks to Wyong Dog Training Club. Like every pup, Panda will thrive with early socialisation and exposure to many different people, sights, sounds, and experiences will ensure he grows to be a well rounded boy. He still has so much to learn about the world and life and would love to be in a home where he is included as a member of the family. Panda will thrive in an environment that guides him with positive direction and lots of love and attention. 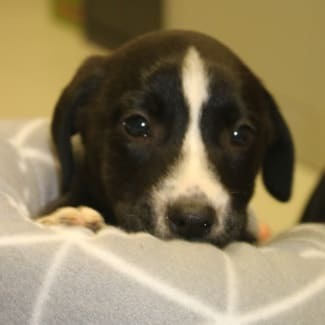 Being young he is still growing into his personality, but this little boy is a very loving pup who cant wait to find his forever home. Please note that if you have an existing dog in residence, we will require a meet and greet to ensure they get along and will be always best buddies. When organising a meet and greet, we will require a current vaccination certificate for your existing dog to ensure that there is no chance of infecting the pups who are currently not up to date with their vaccinations. 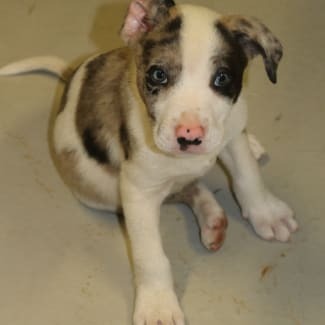 Panda's adoption fee is $600 and includes his desexing, vaccinations and lifetime registration. Panda is also regularly treated for flea and worms. To enquire more or to meet Panda, please call 02 43044350 or email gosfordpound@gmail.com and speak to one of our friendly staff. Panda is looking forward to meeting you. Introducing Wolf! Wolf is a Koolie x Bull Arab. Born on 16th February, 2018, Wolf is looking forward to finding his forever home. Wolf is currently housed with his 8 brothers and sisters and they love to play and get along very well. He loves his human companions and meeting new friends. Being a pup, he will be easily trainable and these loyal dogs love to please their owners. To help kickstart this training, we have included free puppy pre school in his adoption fee, with thanks to Wyong Dog Training Club. Like every pup, Wolf will thrive with early socialisation and exposure to many different people, sights, sounds, and experiences will ensure he grows to be a well rounded boy. He still has so much to learn about the world and life and would love to be in a home where he is included as a member of the family. Wolf will thrive in an environment that guides him with positive direction and lots of love and attention. Being young he is still growing into his personality, but this little boy is a very loving pup who cant wait to find his forever home. Please note that if you have an existing dog in residence, we will require a meet and greet to ensure they get along and will be always best buddies. When organising a meet and greet, we will require a current vaccination certificate for your existing dog to ensure that there is no chance of infecting the pups who are currently not up to date with their vaccinations. Wolf's adoption fee is $600 and includes his desexing, vaccinations and lifetime registration. Wolf is also regularly treated for flea and worms. To enquire more or to meet Wolf, please call 02 43044350 or email gosfordpound@gmail.com and speak to one of our friendly staff. Wolf is looking forward to meeting you. Introducing Ragnor! Ragnor is a Koolie x Bull Arab. Born on 16th February, 2018, Ragnor is looking forward to finding his forever home. Ragnor is currently housed with his 8 brothers and sisters and they love to play and get along very well. He loves his human companions and meeting new friends. Being a pup, he will be easily trainable and these loyal dogs love to please their owners. To help kickstart this training, we have included free puppy pre school in his adoption fee, with thanks to Wyong Dog Training Club. Like every pup, Ragnor will thrive with early socialisation and exposure to many different people, sights, sounds, and experiences will ensure he grows to be a well rounded boy. He still has so much to learn about the world and life and would love to be in a home where he is included as a member of the family. Ragnor will thrive in an environment that guides him with positive direction and lots of love and attention. Being young he is still growing into his personality, but this little boy is a very loving pup who cant wait to find his forever home. Please note that if you have an existing dog in residence, we will require a meet and greet to ensure they get along and will be always best buddies. When organising a meet and greet, we will require a current vaccination certificate for your existing dog to ensure that there is no chance of infecting the pups who are currently not up to date with their vaccinations. Ragnor's adoption fee is $600 and includes his desexing, vaccinations and lifetime registration. Ragnor is also regularly treated for flea and worms. To enquire more or to meet Ragnor, please call 02 43044350 or email gosfordpound@gmail.com and speak to one of our friendly staff. Ragnor is looking forward to meeting you.